Control rooms are the ultimate challenge for any loudspeaker. 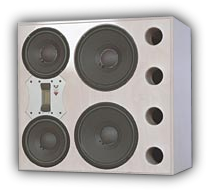 After getting rid of acoustical flaws and installing a decent power amp it all comes down to the quality of the electro-acoustical transducers. With nowhere to hide and spotlights all over your body it's difficult to stay calm… But it helps if the designer gave you 30 mm walls, flush mount units and top quality crossover components. If he also gave you a ribbon mid-high unit your confidence is boosted. Now you know you will succeed. D'appolito was a genius. Many designs use it's theory. Some achieve the qualities sought for. Listen to this one and judge for yourself. Switch to active for even better results (with our DS50 amplifier). Only the biggest control rooms can house shapes like these. So…? Stop mourning and build a bigger control room (reserve space for 3 extra amps). The HE50 from the SA High-End Series was developed as a no nonsense High-End amp with the most possible sound quality in mind. 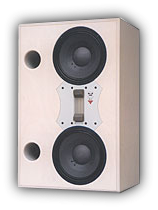 The HE50 uses No-Compromise audiophile components such as Low-ESR capacitors and Ultra Low THD / Ultra Low Noise buffers. To accomplish the maximum listening pleasure the HE50 is from a fan-less design. The HE50 is the first High-Power amp in the world with High-End specifications and sound quality.